A media keyboard with a twist, but does it work? Simply in terms of the idea, I like the thought of a modular keyboard, especially if you're talking media centre-style. 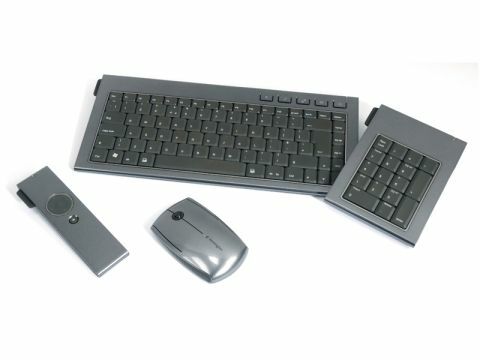 Having a full keyboard with a removable number pad and media remote would be very handy. Sometimes you don't need the extra buttons and sometimes you do - see, handy. Except when it's executed as badly as Kensington's SlimBlade. It's fine when flush on the desktop/coffee table (it is a 'media' keyboard after all) but if you deign to pick it up then both side-mounted modules slip their pathetic rubber/magnetic fixings and fall to the floor in a clatter of over-priced periphery. It's a shame as the core keyboard is damn good; it's solidly built and responsive when typing. The F-keys and cursor keys though are a little close to the rest of the keys which can lead to some erroneous typing. But when half the package is utter tat, why would you fork out close to £100 for the privilege of having flimsy, flappy modules fall off the sides of a decent keyboard? Trust us, you'd soon jettison the extras and stick with the keyboard, and wonder why you paid for such redundant gimmicks.